Villa Eleni is in a great position, with wonderful views over the Kassiopi hillside, down to the harbour and across the sea towards Albania. The spacious first floor dining and chill out terrace is the perfect place to relax and enjoy the views, but it's only 5 minutes' drive into the resort if you prefer to eat out or visit the beach. The central harbour is lined with good tavernas, shops and a few lively bars. Air conditioning/heating in the bedrooms, pool heating and WiFi are included. This impressive villa has breath-taking views over the sea to the Albanian coastline. Plus, it's only 5 minutes' drive from Kassiopi! The private swimming pool has marvellous views down towards Kassiopi and the open sea. There's ample space to sunbathe, or the pergola with table and chairs at one end of the terrace provides shade if you prefer. You'll also have your own stone BBQ by the poolside for delicious home cooked meals! At the front of the villa is a private parking area with steps leading to the entrance. The lounge has large windows along one wall keeping the villa bright and airy, with fantastic scenic views of Kassiopi and the sea. There is an ornamental brick fireplace with a decorative arched alcove on either side, plus plenty of seating and a flat screen TV. There's also a table and chairs for interior dining, and the adjacent fully equipped kitchen has a smaller table, perfect for breakfast. Patio doors from the kitchen lead to the pool terrace and there's a handy utility room for extra storage. There is one twin bedroom on the ground floor and 2 more twin bedrooms, one with an en suite shower room, on the first floor, all with pleasant inland views. The 2 first floor double bedrooms - one with an en suite bathroom - are sea-facing and share the large upper dining terrace with glorious views of the North Coast. There's also a separate bathroom on each floor. This villa is registered and licenced by EOT Greek licensing association. This number is: 80010829K122K810. 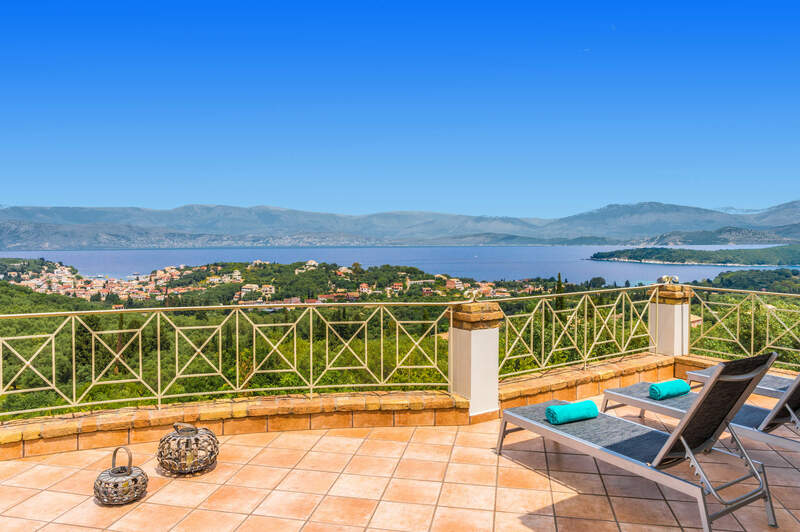 Villa Eleni House commands wonderful views over the sea from its position, perched in the hills above Kassiopi. It's 5 minutes' drive into Kassiopi which has several small beaches and a harbour lined with tavernas overlooking the boats bobbing in the water. This popular resort is one of the most established along this stretch of coast, with many shops and bars to choose from too. It's easy to explore the island by car, or why not hire a boat and visit the neighbouring resorts by sea? Kassiopi has many shops selling clothes, souvenirs and beachwear, as well as fresh food and daily essentials. Corfu's only market is in the capital, Corfu Town, which offers fresh fish, vegetables and fruit. The town also has a huge choice of shops, ranging from traditional, quaint gift shops to high street brands, mini markets, fishmongers, butchers and a national chain super market. Plus, there are a couple of bakeries selling fresh bread and a wide selection of locally made pastries. Kassiopi has the largest selection of restaurants on the North East Coast, serving international and authentic mouth-watering dishes. Around the harbour, you'll find a whole host of bars and restaurants to suite all tastes. There are contemporary waterside venues as well as more traditional Greek tavernas. The popular bars have karaoke, live sporting events and even Greek dancing! The resort has a few small pebbly beaches where you can sunbathe and swim. Stretching west, away from the headland, is the longer beach of Imerolia. The beaches around the area can all be reached in around 5 minutes by car, or you can venture further to the larger beach at Avlaki, 3 miles along the coast. A horse riding centre, dingy sailing facilities and boat trips can all be arranged locally. A small water park - Hydropolis - is located in Acharavi, around 8 miles from Villa Eleni House. The larger Aqualand Waterpark is in the centre of the island, in the village of Agios Giannis, an hour's drive south. Motor boats can easily be hired by the harbour to explore the stunning bays of Kouloura, Kalami and Agni along the North East Coast. Any of the other holiday resorts along here can also be easily reached by car. Or why not venture up Mount Pantokrator, Corfu's highest point? You could also visit Paleokastritsa and enjoy the superb views from the hillside and a visit to the small but charming monastery. Corfu's only golf course is 23 miles away, in the centre of the Island, near the village of Ermones. Keen sightseers might like to go exploring through the traditional village of Old Perithia - an abandoned hamlet, which today is being brought back to life as the ruined houses are being renovated and summer tavernas cater for visitors. Villa Eleni House is not available to book for season as it is sold out. Take a look here at the Corfu villas that are currently on sale.